Robots are increasingly accepted as the first line in automation, human-computer interfaces and even entertainment. However, they are often thought of in a limited way, as machines that could be designed to resemble humans, or body parts such as arms, designed to perform in a manner that is a variation on how a human would. Therefore, robots are often in a fixed shape with relatively limited dimensions of movement, articulation and manipulation. However, robotics could also mimic other living creatures to achieve goals and assist humans in spaces and environments where we can’t or shouldn’t go. This approach to robotics has recently been implemented in a research project, described in a 2017 Science Robotics paper. The team behind this achievement, who are based at Stanford University, has designed a robot that acts more like a vine or a fungus to “flow” into restricted areas and to take up space. In other words, this robot can grow. The robot is made up of a flexible plastic tube that is pushed outwards by its tip using air pressure. The tube comes tightly coiled up, like the open end of a balloon. Its sealed end, which forms the rounded tip, extends outward as a tendril from a plant would. However, the robot does this at a greatly accelerated rate, which is driven by the inflation of the tube through air pressure delivered using a pneumatic pump at the other end. This process is known as eversion, and is similar to the methods used by plants, fungi or nerve cells to extend themselves through space. The tube can also carry a thin cable at its centre, upon which sensors or other control mechanisms can be mounted. This enables the robot to determine what it should ‘grow’ towards next, find targets in 3D space and send telemetry back to the user. The robot can also change direction by inflating asymmetrically at the tip and favouring one part over the other, meaning that when the left edge is inflated, the robot turns right). This design has enabled the robot to perform some impressive tricks. It can fit into small spaces, such as under crates and into small cracks left in simulations of disaster scenarios such as an avalanche or a building collapse. The robot can move along the ground or lift itself into the air, and can also squeeze through variations in tight spaces. It can also lift a corner of a crate by snaking in underneath it and inflating itself to elevate the object on top of it. The robot can also support itself in the air and even push some lighter obstacles aside. Despite the fact that the researchers used cheap materials such as plastic tube to make their prototype, it still passed an ‘obstacle course’ set up for it, and proved that it can mimic the plant-like growth the team had in mind when they designed it. The new type of soft robot has many advantages over more conventional android-type machines. It has few moving parts, which may restrict movement and bending. It is lightweight, so that it can extend vertically, and can make some simple shapes such as spirals, in the air. The robot is also strong and can take considerable weight, thanks to the air pressure that supports it and its polyethylene skin. The robot can also turn easily in space, fit through small cracks and keep going even if it encounters obstacles. The robot is also designed to negate the problem of getting stuck on something: if it is caught on a nail, or even in glue, it keeps growing outward from the tip. The ‘stuck’ segment left behind can’t be punctured or torn because it won’t move again. The creators of the ‘vine-bot’, led by Professor Allison Okamura of the Department of Mechanical Engineering at Stanford have a huge range of applications in mind for their creation. The robot could help to rescue the victims of natural or urban disasters, as it can be outfitted with carbon dioxide sensors to find people who are trapped or crushed beneath rubble or snow. The robot could also be used to extend antennae upwards in the communications industry, or investigate blockages in underground pipes or tube systems. The robot could also benefit from better, more durable materials for its tube, sensor or propulsion set-ups. The team at Stanford already intend to replace the pneumatic pump system with hydraulics, for example. These refinements could further enhance the ‘growth’, motility and strength of the vine-bot. The vine-bot could also be at least partly autonomous, when combined with cameras, sensors and the appropriate software to run them. The Stanford prototype was already somewhat capable of making these decisions based on the images captured from the leading edge of the tube. These robots could also conceivably transport substances, most likely liquids, which could benefit disaster victims or help fight fires in tight spaces. Additionally, if these robots could be miniaturised enough, they may also have a role to play in exploratory surgery and other areas of medicine. All in all, the Stanford vine-bot may be the first in an exciting new line of robotics based on growth and movement in nature. Hawkes EW, Blumenschein LH, Greer JD, Okamura AM. 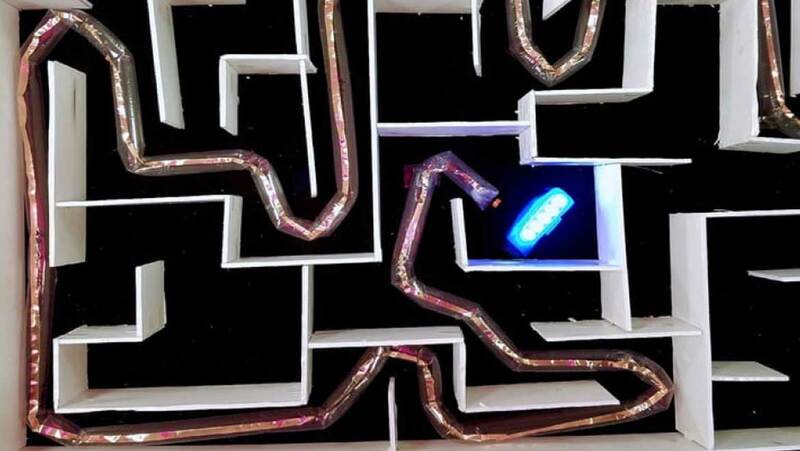 A soft robot that navigates its environment through growth. Science Robotics. 2017;2(8).